Long time followers will know that I like to do one of these when each season is approaching, and with today’s sudden downpour I thought it was fitting that I started to dream about my winter wardrobe! I think it’s a nice thing to look back on and see how much fashion has changed in such a short space of time, and how much my personal style has changed, too. I’m definitely more comfortable in my skin than I was a year ago, even though my appearance hasn’t changed all that much. I’m now more confident to experiment with colour and print, and my change in hair colour has made me go for different colours and necklines that I may have done in the past. 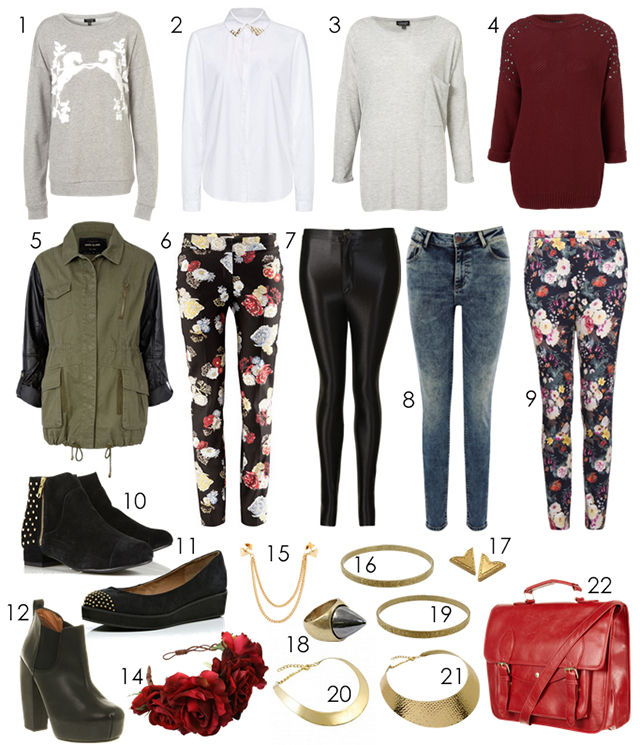 I’ve put together some things I’m lusting after for the cold weather, which let’s be honest, is well on it’s way! Number one on my list (number 5 really) is the River Island contrast sleeve khaki jacket. I am in love! It reminds me of the famous Zara one that has done the rounds and sold out everywhere. I’ve actually asked for it for my birthday so it may just be mine very soon! I’m still loving floral trousers, so the two pairs above were an obvious choice and a nice change with the autumnal colours. Other things I wanted to see in my wardrobe are oversized sweaters and knits, more disco pants and skinny fit jeans, and some crisp collared shirts. Shoes are one of my favourite things to buy in winter, just because I prefer to wear boots rather than summery sandals and pumps. I’m lusting after flatforms, studded ankle boots and a pair of heeled Chelsea boots similar to my Topshop Allegras but higher. I’m also after a new bag, preferably a satchel, but I really want something in a statement colour like the red Topshop one, or maybe even one from The Cambridge Satchel Co! Finally, down to the details. All the jewellery above is by Rock n Rose, a brand I am loving at the minute. I adore their red rose crown, and you all know how much I love my collar necklaces! Add to this some collar tips, simple gold engraved bangles and studded rings and you have yourself a jewellery collection to die for! I hate to say it, but I’m ready to put away my summer clothes and get out the big baggy jumpers. I love the sun but I hate to-ing and fro-ing between seasons. Make your mind up, weather! Oh, and I appear to have missed out a n umber 13, oops! What are you looking forward to wearing this Autumn/Winter? Lots of over-sized and cozy knit jumpers with skinnys and ankle boots! I love Autumn Winter! My favourite season. If you're looking to save a few pennies, then i've seen the Primark A/W winter collection, with exactly the same contrast sleeve khaki jacket! I never realized I needed a gold collar necklace. I now need a gold collar necklace. Now. i just bought a khaki jacket like that from primark for £25 – bargain and i just bought the black disco pants from glamorous too can't wait for those to arrive!